I only recall learning in school (in NY) that Christoper Columbus “discovered” America. The two men where peers. Onboard The Matthew — well, the replica of it — I learned about John Cabot (Giovanni Cabboto) and how although he wasn’t actually the first to sail this route, he was the man who sailed it in the name of England and officially claimed it. The British volunteer on board told me that Columbus landed in Venezuela (named for Venice, Italy) and Central America, rather than any part of North America. It’s Cabot and his crew that first claimed a landing in North America. This is an almost exact replica of the ship that John Cabot and his crew of 16 or 17 men sailed. 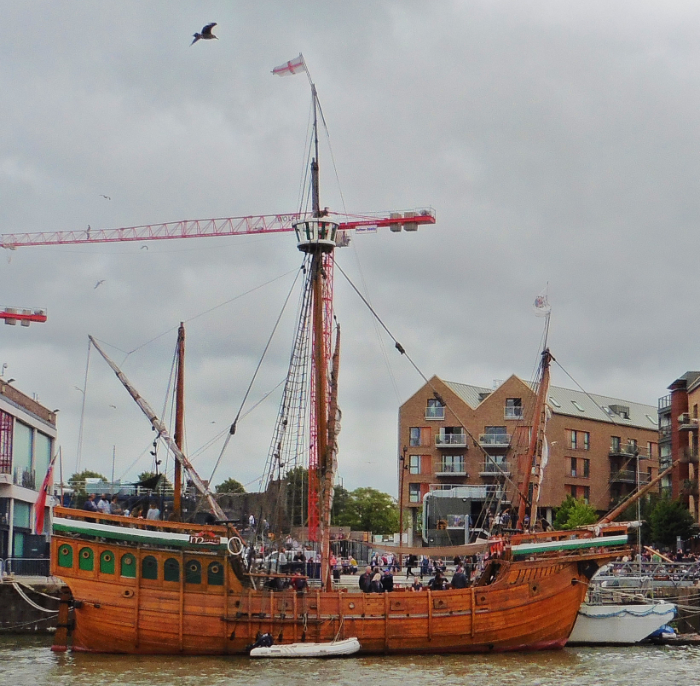 It was built from 1994 to 1996 to recreate the historic voyage to Newfoundland and back to Bristol in 1997 on the 500th anniversary of the original trip. Now she sails for films and festivals. And can be hired out for private events. Looking around, I asked the volunteer how deep and what it was like below where I imagined the crew’s quarters were. Livestock? I hadn’t thought of that. The livestock provided the crew with fresh meat. He said the only time the crew might have stayed below would have been to warm up by the body heat of the animals. I can’t imagine living on deck for so long. This isn’t a cruise ship full of comfy lounge chairs. The crows nest, I learned, isn’t of the original wood any more because it was too top-heavy to stay upright in her harbor home. I can’t image how it made a journey across an ocean, driven by the wind and not topple over out there. Nor can I imagine being the person to man that position. 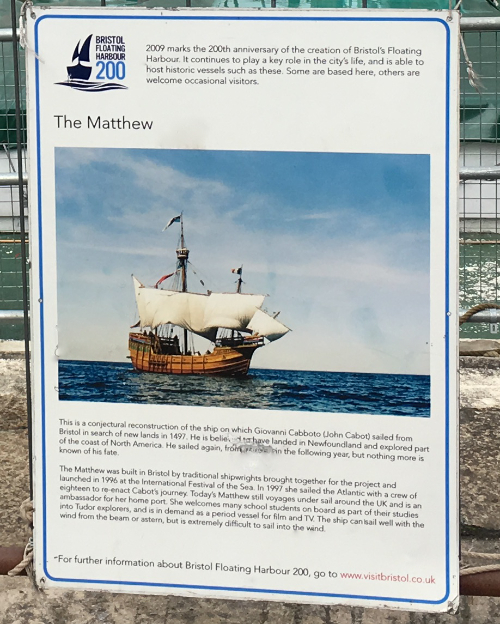 The sign about The Matthew. Click for larger image. Next, I asked about the wooden pegboard with pegs tied to it. (I wish I’d taken a photo.) This, he explained, was how they kept their log. At set intervals, they’d take a directional reading and they’d put a peg in the board to mark the direction they were heading. Then the captain would mark this information into the written log and the pegs were used again for the next set of readings. I expected the board to be a more complicated calculation machine or marker. The official website provides info on how to get there by car, bus, and train. Admission is free when it is stationed here. The official website for The Matthew is matthew.co.uk. This site is chock full of information about the original voyage, the replica, and coming on board or renting it out. It’s got a lot of interesting reading. Especially for a North American who has lived his/her life believing the Columbus story. Perhaps this full-width photo provides a fuller an idea of its size. To see how small The Matthew is, here it is in its surroundings. 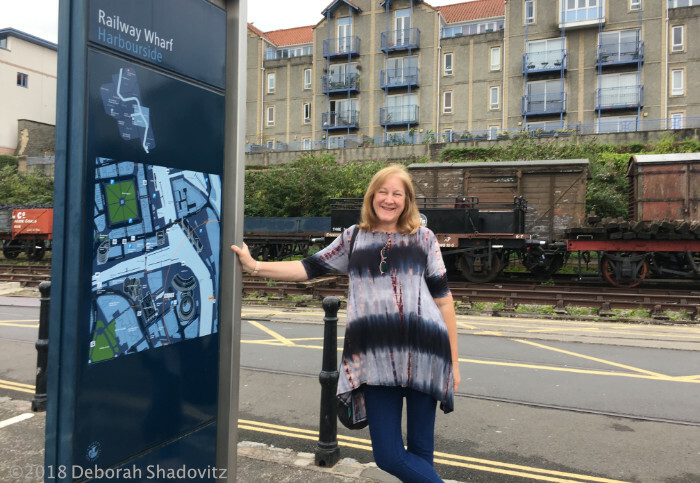 There’s much more to see and explore in this area too. You’ll walk past all of them. And then there’s alway a good pub meal before, after, or both. We enjoyed a meal at The Pumphouse. Thanks for this great Derry!